Cervical collars or neck braces help support and immobilize the neck after injury, neck strain, or whiplash. Whether you need a cervical collar or headgear to protect your head from concussions during soccer, we have the right head or neck support for you. Our bracing experts recommend the following supports for head and neck pain. Neck braces and cervical collars are ideal for helping heal head and neck injuries by immobilizing the area after an injury has occurred. This is important in order to help prevent movement that could further injure the area. Neck braces are commonly used after events such as car accidents or extreme sports injuries. Paramedics and other types of first responders often use cervical collars to stabilize the neck after an injury. Once the doctor has examined the injury, he or she may choose to keep the patient in the neck brace. They help during rehabilitation by supporting the weight of the head and keeping pressure off any strained neck muscles. 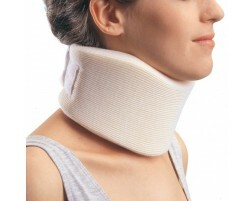 A good neck brace or cervical collar not only protects, but they will be comfortable as well. Check out our wide selection of head and neck braces and cervical collars today!